Omaha’s Henry Doorly Zoo and Aquariumopens a new window, and Omaha and Council Bluffsopens a new window public libraries have a partnership to offer free zoo tickets to library members. Adults ages 18+ who are Douglas County residents or have a non-resident paid membership to OPL are eligible to check out the tickets. Accounts with outstanding balances greater than $25 may start a payment plan in order to obtain a ticket. Expired accounts must be renewed and outstanding fines must be paid in order to obtain a ticket. Due to the great demand and limited supply, tickets cannot be held or reserved. Tickets are good for one-time use. Only one ticket per library card and customer can be issued, admitting up to two adults and six children. 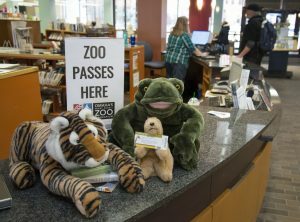 An OPL library card must be presented to the zoo at the time of redemption. Douglas County residents who do not have a library card, but would like to receive one may sign up for a new account with identification and proof of residency. New patrons may sign up for a library card online at omahalibrary.org/get-a-library-card, but the card will not be activated without in-person identification. For more information, call or visit your neighborhood OPL branch location, or visit omahalibrary.org. Do I have to be present to pick up the zoo ticket at the library, or can a family member pick up a ticket for me? Who can use the ticket? Do I need to present my library card at the Zoo? I’m not able to get to the library on the first day tickets are being issued. Can you hold one for me? I have an Omaha Public Library card, why can’t I have a ticket?